It has been over a month since we left Chile. Life has been crazy and this summer has flown by! I am working on finishing up my research project and we are sadly wrapping up this course. 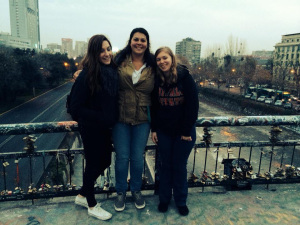 The three weeks we lived in Chile were well spent. I am thinking back to all of the moments I stopped and reminded myself to never forget. 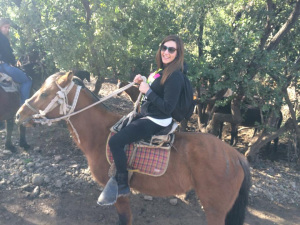 The personal and professional experiences were both extremely valuable and I will carry everything I learned in Chile with me as I move forward in my career. The personal growth I experienced included becoming more flexible and keeping an open mind. 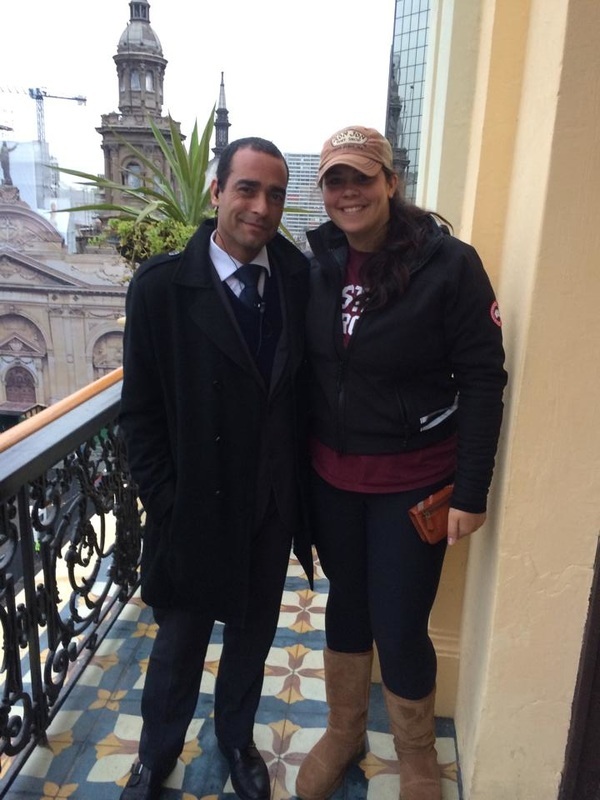 We had many conversations about the relaxed atmosphere of Chile’s culture. While we are used to tight schedules and living by the clock, the Chileans spent their time enjoying one another’s company and if a meeting runs late, that’s okay. I had a very fixed opinion on how important schedules are, and I still think its respectful to show someone that you arrive at a certain time to show you are reliable and can manage time, but in Chile their culture is different and they have the luxury of a more casual time schedule. It is good to recognize the benefits of both of these concepts. Thinking about my future teaching, I will always keep with me the ideas of language learning. Putting myself into a similar situation that many students come to our schools and face was the best challenge I could have given myself. Taking the Spanish classes at Ecela were completely in Spanish, my host family only spoke Spanish to me, and every restaurant or shop we went to brought us more Spanish. It was exhausting and I needed a lot of help. As far as learning the language I would have liked more pictures and different approaches to learning the vocabulary and this is something I know I will need to offer to my English language learners. I also learned how it felt to be in front of 25 eighth graders yelling at me to say something in Spanish that I had no idea what it meant. They were all laughing and I felt like they were trying to get me to say something funny so they could laugh at me, and that made me feel awful whether their intentions were good or bad, I had no clue. This idea sticks with me and I hope to remember that when I have an English language learned it is important to not just keep telling them to “say this… say this…” and that laughter can be confusing when you don’t understand the humor. Thank you to everyone that made this trip possible and everyone I met along the way! Dr. del Prado was the most amazing human being to travel with. We were so thankful for her guidance and Spanish speaking abilities! I don’t know what we would have done with out her scheduling our plans, plan b’s, and plan c’s. It was so great to get to know Dr. Patti, who I had not known before the trip! She brought so much to the table with her expertise in EXE Ed and her sense of humor and giant backpack gave us many laughs along the way. 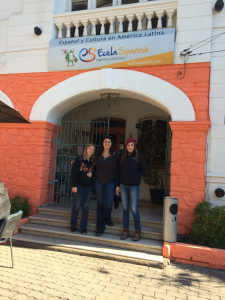 Ecela was an incredible school to study Spanish at. I loved the set up and the classes I took. 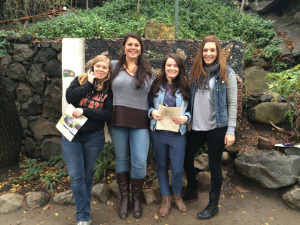 The opportunities to meet other people from around the world in that setting were so valuable. They set up many activities for us to interact with all of the other students. 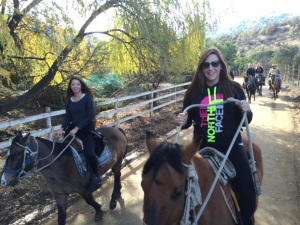 Horseback riding, trekking, watching the World Cup, cooking empanadas, the trip to Vina del Mar and Valparaiso… were all major additions to the trip that really helped us experience Chile. I loved my teachers Javier, Francisco, Ingrid, and Rodrigo. And I’d like to give a major shout out to Astrid, who planned all of our fun outings with her larger than life personality. It was also through Ecela that we met our dear friends Nicci and Nikki! Nicci from Scotland was an amazing girl that I hope to one day visit in her country and Nikki from Miami shared some incredible memories with us, I hope to see her soon and I will always consider her a friend. Escuela 25 is a wonderful school to partner with and actually working in the classrooms with the children was such an amazing experience. I can still see their smiling faces! They were all so excited to learn English with us and ask us a million questions. 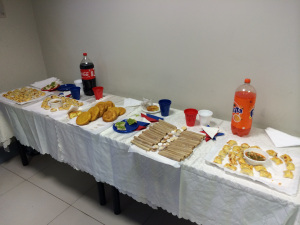 The last day we were there when they did “English Day” for us was such an impressive effort that they put together! I am so thankful for the principal and all of the teachers who welcomed us into the school. Universidad Mayor was another crucial partnership that welcomed us to Chile. The professors and students were so good to us and I am glad that we have a relationship with us. My penpals Catalina and Danella were so helpful and I loved having the opportunity to write to them before even leaving for Chile. It was wonderful to have the opportunity to present at their University and I really hope that one of their students will get to come here and study with us at our school. Last, but not least and I hope I’m not forgetting anyone! I owe my life to my amazing host family, Meri, Ignacio, and Javiera. In three short weeks I went from, “Daniela from Neuva York” to “Princesa Danielieta.” I was so comfortable with them and not only did they cook me wonderful meals but gave me a great place to live, have some really great conversations, and become part of a Chilean family. Friday was our last day at Ecela. I was so sad to leave! My Spanish was really improving and after two full weeks ther, I really felt like I was developing a routine. We were also exposed to a new professor Friday morning, named Rodrigo. We loved Rodrigo! He was a very smart man and clearly knew a lot about pedagogy. While we liked all of our professors at Ecela, this one in particular really had a specific teaching style that really made sense to us. It is extremely difficult when you are a beginner and exposed to so many different parts of a language in just two weeks and some techniques were helpful to,us while others were more challenging. Rodrigo did an activity with us where we created biographies about each other. He definitely had us hit all four language modalities including speaking and listening and reading and writing. He also had us moving around the room and working with different people while at the same time coming around to correct our grammar and clarify any confusion. I thoroughly enjoyed this lesson and may be able to use it with the 7th and 8th graders next week when I teach! 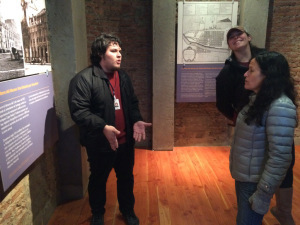 After class we visited the Muesum of Memory which holds the history of the genocide that took place here in Chile during 1973-1990 during Pinochet’s dictatorship. The material was extrmemly heavy and sad but very interesting, I had no idea that “once de Septiembre” had a significance in this country long before it became so important to my country. The Museum was incredible and I recommend it to anyone who visits Chile. I was impressed by how they had it so organized and families could really pay tribute to their lost ones in this special place that will always honor them and educate people on the unfortunate events that took place to cause their deaths. Today we took a long drive up to the Andes! We finally got to go on our trekking excusion! It was absolutely unreal. The whole drive up the mountains I couldn’t believe my eyes. The view was what we like to call a, “Buenavista!” We stopped to take a few photos and it was incredible to take that first step out of the car and be surrounded by these massive snow covered mountains! The tour guide also pointed out the active volcano we would be hiking near! That was interesting to say the least, I was very interested in the safety procedures in the event of an eruption! When we finally got to the place where we’d start hiking we had to layer up and add covers over the bottom of our pants and over our shoes! These were very crucial in keeping our feet dry. Trekking up the mountain was a lot more difficult than I imagined it would be! The altitude made my head pound and I felt like I had an ear infection. I had to focus on where I was walking so I mostly stared straight down at the snow in front of me and when I would look up at the mountains around me I would feel dizzy! It took a while to get over this feeling but I loved the whole experience. It was so hard! I would be walking right along and all of the sudden sink, thigh-deep into the snow and have to wiggle out to get up and keep walking! The view at the top was well worth the fight up th trail! I’ll never forget feeling so small and being surrounded by those gigantic, beautiful mountains! It was definitely a once in a lifetime moment. The hike back down the trail was a million times easier than going up and I enjoyed running through the snow and hopping down the trail. 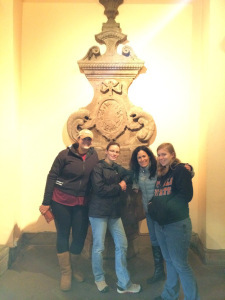 After Spanish classes we had to rush over to Universidad Mayor. We met up with one of the women to accompany us to School 25! This was an interesting day to tour the school because it was just before Chile was playing against Spain in the World Cup! Many of the girls had their faces painted and wore all kinds of digestive Chilean futbol gear! Even the youngest children were chanting my favorite cheer, “CHI CHI CHI, LE LE LE, VIVA CHILE!” We had a meeting with the principal and our cooperating English teachers to talk about the schedule next week before walking the grounds and seeing some of the children! It was so fun to have them walk up to us and say,”Hello!” When we would ask, “How are you?” There was some confusion but it was to start gauging how much English they know. From my initial impression, the English teacher I will be working with seems really great and I am looking forward to tagging along with her on her packed days of teaching 4th-8th grade English! The tour wasn’t very long because everyone was in a hurry to watch the game so our group headed to one of our favorite restaurants, Bavaria! It was packed and everyone was cheering for Chile! This game was very important because they were playing Spain, who are the defending champions of the World Cup! Big deal! Yesterday was by far, my favorite day! 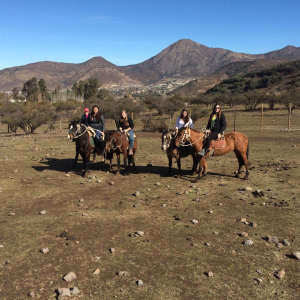 Horseback riding in the Andes was absolutely breathtaking. The scenery was impeccable and the weather was perfect. 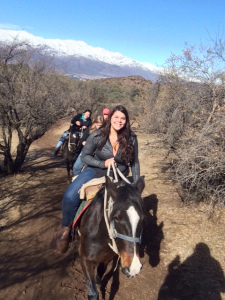 When I notice the day to day relaxed pace of the Chilean lifestyle I constantly wonder, “How?” Horseback riding was really an opportunity for me to experience that sense of relaxation. I had a scheduled time period that was dedicated to trotting along a beautiful mountain without a care in the world. It was one of those moments that you want to remember for the rest of your life. My horse, Filipina, and I got along so well. She definitely had a fiesty horsenality but once I figured her out, we had a great time! Today Ecela was different because we changed teachers! It is nice to get to know different professors but I think I could have really benefitted from working with the same teachers a little bit longer. Spanish is going well and I hope it sticks with me after I return home. 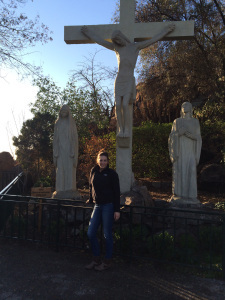 After our classes, we went to Cerro Santa Lucia, which is where Spain took over the country when they fought hundreds of years ago! Ecela was particularly difficult today because we had a totally different teacher and it was set up a little differently. I can’t believe I made it through the first week. My Spanish has already improved tremendously and I am really enjoying learning the language! We had another great lunch before walking to tour one of Pablo Neruda’s houses. It was awesome! Pablo Neruda is a really famous poet from Chile. La Chascona is the Santiago home of Neruda that he shared with his wife Matilde from 1955 until 1973. We got to walk through the home and had devices to listen to a tour in English. It was a really interesting story and the house was so artistic. Unfortunately, we were not allowed to take pictures inside but it was incredible! The girl in between Sam and I is our new friend Nicci, she is from Scotland and has been tagging along with us! I love getting to know her! I have asked every question in the world about Scotland and now I’m dying to go there to visit her one day. After hanging out at Pablo’s, we had to find a place to watch the game! Chile played Australia in the World Cup! 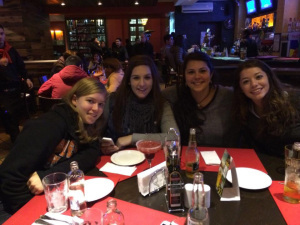 We met up with another Nikki (from Miami) and went to a restaurant in Bellavista. It was a great night watching the game and celebrating the win with the Chileans! The streets were packed and the people were going crazy! These are from the courtyard of the house. 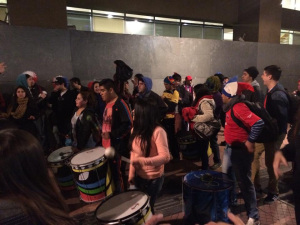 At the restaurant in Bellavista with Nikki and the drum parade after Chile won their game against Australia! I don’t have too big of an update today! Just our regular morning of Spanish classes followed by lunch. 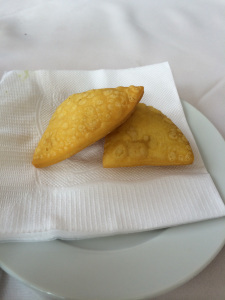 We’ve all been really good about trying different things every time we go out, so between that and having typical Chilean meals from our host families, we’ve really had a chance to try many different foods! It is my host brothers birthday today so I am wondering if we will have anything special for dinner tonight. We went back to Ecela in the afternoon to watch the first game of the World Cup in Brazil. 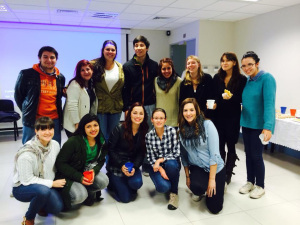 It was a great experience because we have many Brazilian students studying at Ecela with us. They were going absolutely crazy. They were singing, chanting, and yelling through the whole game! I was very glad that Brazil won the game because I was scared to see their reaction to a loss. Another great day here in chile! Adjusting pretty well considering that my brain is close to exploding from the overload of being full submersed in a new language, becoming familiar with a new city, and living with strangers! Loving every minute of it! Extremely hard to be away from Knicholas but we will be fine! After lunch we bought Chilean phones so we can call each other and our host families, so we are happy to have those in case of emergencies, or to let our families know if we will miss dinner, or just to keep our group connected! We also went to buy our metro cards so we can ride the metro. This was our first time using the subway. I hated it, it was just very much out of my comfort zone and made me dizzy to watch the trains while I was standing on the platform. Definitely a form of transportation that will take some time for me to get used to. We did think of our dear DR. TRUESDELL (shout out!!) when we saw this though-Biblio metro supplies books for passengers to check out and read whole they’re on the train! We took the train to Plaza de Armas, a suggestion made by the students from Universidad Mayor when they presented yesterday. 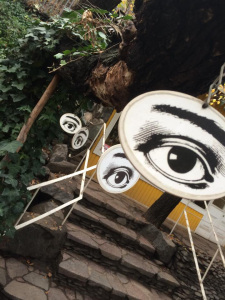 The plaza is the heart and soul of Santiago de Chile! Surrounding the plaza are important buildings such as the Metropolitan Cathedral of Santiago, Central Post Office Building, and the Museum of Natural History of Chile. 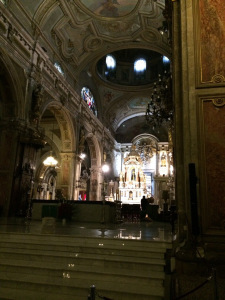 We visited the Cathedral and the Museum. Both were great sights to see and thanks to Sam, we got a bonus tour at the museum which allowed us to go up inside of the clock tower which is coincidentally named after Benjamin McKenna who is also the name of the the school we will be teaching at while we are here, Escuela 25. With the secret tour of the clock tower, we were able to learn about his history and how he impacted local education leading to the school being named after him and then he was also involved with the museum, making changes to the clock tower to lead to how it looks today. So in Chile they have breakfast, lunch, and dinner + a meal called “once.” Once is my best thing! 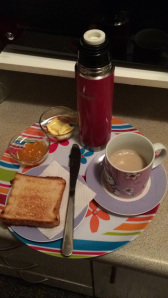 It happens around 7:00 and usually tea or coffee is served with cookies. 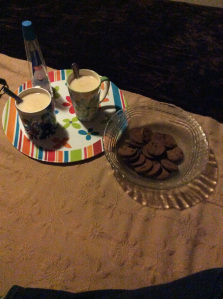 At my house we have deliciously sweet cafe con leche with chocolate cookies. I love it so much. Tonight, I asked my sister, who was the only one home at the time, “Are we going to have once?” She replied no and explained that we didn’t have any cookies. After spanglishing about how much I loved once and the chocolate cookies, she ended up walking to the store just to buy cookies! She came back and prepared the cafe and we had once together and had a great conversation. I seriously love these people. As if it couldn’t get any better than that- I mentioned last night that my favorite food was cheeseburgers, so guess what was for dinner tonight! Yep, leave it to my host mom to cook me the most delicious hamburgers! I’m spoiled! Once con mi hermana, Javiera! Yo estoy muy cansada. Necessito mas dormir! 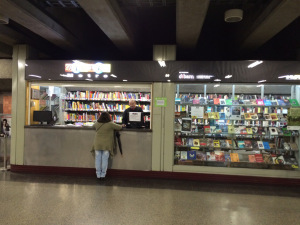 Biblio metro supplies books for passengers to check out and read whole they’re on the train! Secret tour of the clock tower. 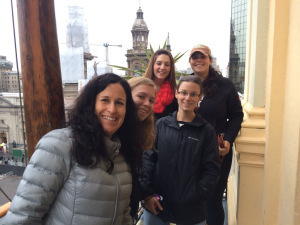 Our group on top of the clock tower with Plaza de Armas below. After Ecela today we went to lunch at a nice restaurant. I had the meal that was the promotion for the day which included salad, steak, mashed potatoes, and a dessert. 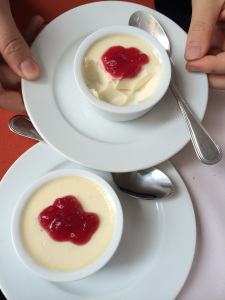 The mashed potatoes are very similar to ours but just different enough to make them even better! Everything was delicious. I didn’t really like my dessert but it was okay because Sam let me taste her delicious chocolate mousse! After lunch we went to meet the students from Universidad Mayor! Everyone was so nice and it was a really fun gathering! 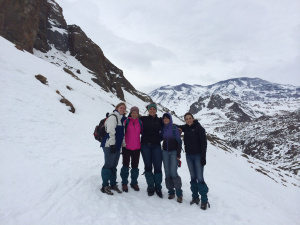 We made plans with some of our new friends and they took us back to Bellavista where we hung out for a little while before walking home to be with our host families. My host mother is cooking dinner now. It is hard to get used to the late dinners, especially when I am so exhausted! The days are long and busy with a lot of walking but I wouldn’t have it any other way! Chile is absolutely amazing so far! The long hours of travel were totally worth it. We had a mishap when our plane landed later than expected and the van that had been arranged to pick us up left the airport before we landed. 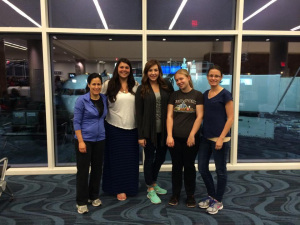 We quickly came up with a plan b thanks to a very helpful man from the airport and I couldn’t have been more thankful for Dr. del Prado’s Spanish and experience to help us out of that one! After traveling for over 24 hours, no ones brain was working properly! I was the first to be dropped off with my incredible host family. I live with Mery, mi mama, Ignacio (21,) mi hermano, y Javiera (15,) mi hermana. They live in apartment building on a fairly busy street. I have a nice room that has been very comfortable so far. Mery is very accommodating and loving. I am really enjoying getting to know them. Yesterday we arrived, met our families, and napped before meeting back up as a group for lunch. It was very cold yesterday and we were all bundled up! It has been difficult for us to get used to being so cold in our houses because they do not have heat. My family has a small portable heater that they occasionally move from room to room but indefinitely had to sleep in winter socks, slippers, sweats, a hoodie, thick gloves and wore my beanie. My bed is right under a window and I was freezing! This morning we all met at ECELA. Ecela is the school that we study Spanish at. We take two classes from 9-1 there. The first class is a conversation class and the second is more about grammar. In the first class we had Profesor Javier. He was very friendly and taught us a lot. We started with basics: Soy Daniela. Soy de Nueva York. Tengo vente y cuatro anos, etc… We also had a large lesson about directions, which is helpful since we do a lot of walking in this unfamiliar city but very confusin to learn! 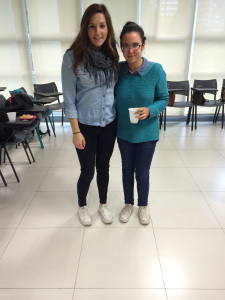 In the second class, we had Profesora Silvia. She taught us vocabulary and the alphabet, as well as, the verbs ser and estar. We have already started to make some new friends (all thanks to Sam and her outgoing personality!) We met a girl from Scotland, a girl from Colorado, and there are many people here from Brazil. I feel like I did really well in my Spanish classes. A lot of my Spanish is definitely coming back to me. It is exhausting to have the constant language barrier though! Now that I’m in bed, I just want to turn my brain off! After school they had a really nice welcome lunch/meeting for us. They served us Chilean empanadas, salami, olives, and chips and dip. From there we decided to take advantage of the beautiful weather that we had today and take a walk to San Cristobal. 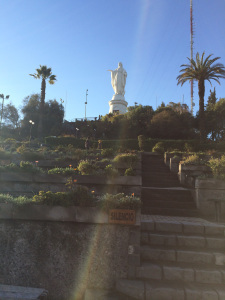 It is a nearby mountain with a large statue of the Virgin Mary and they also have a zoo there. It was a long walk to San Cristobal, but it was very enjoyable to make our way through the city in the good weather. 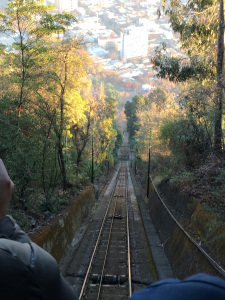 We rode a funicular straight up the cerro (hill) to see the views. Once we reached the top, we still had many steps to climb before reaching the statue. 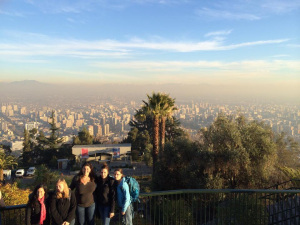 We saw beautiful views of the mountains and Santiago. Sam and I spent a lot of time talking to more new friends- an economics student from New York City and a student from Switerzerland. The people you meet while you are traveling are incredible. 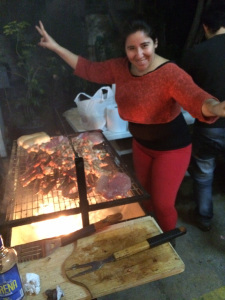 After visiting cerro San Cristobal, we had to be back at Ecela for a BBQ! This was a really nice evening with the staff from Ecela and other students. They had a large grill that they cooked a ton of asado on! They also had corn, potatoes, rice, and salad. The meal was delicious! There were many conversations all around the table. I sat next to girls from Germany and France who both spoke excellent Spanish, I was very impressed. I admitted to Dr. del Prado and Dr. Patti how surreal the experience felt. It looked like a movie to me. Everyone was participating in rich conversations, enjoying the company of others, the meal was very informal, everyone took their time and ate while they chatted and at the same time I couldn’t shake this uneasy feeling like I was in a hurry or had somewhere to be. It was so stereotypical American of me but I really had a hard time just enjoying the moment. I had no where to be, I am here to have these types of meaningful experiences, and there I was checking the time and feeling like I needed to get home. I hope that by recognizing I learn to change this natural feeling in the next few weeks and appreciate the time I spend here and the people I am surrounded by. 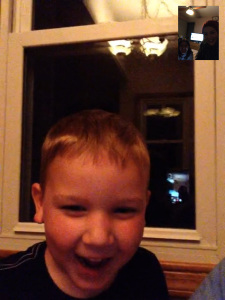 When I did come home, I was finally able to FaceTime Knicholas. He was so happy and I couldn’t help but continue to speak Spanish. He said, “Stop speaking Spanish! Use your words!” Hahaha I also got him to count to ten in Spanish for my host family, which they really enjoyed getting to “meet” him. I feel like I have so much to write but I’m so tired! I hope we have more nice weather! I couldn’t have asked for a better host family and already love them. My host mom is so cute. The cafe con leche is my favorite! Amber, Sam, and I in front of Ecela on our first day! Astrid from Ecela cooking all of the asado for our BBQ! We left Buffalo this morning and flew here to Atlanta. Our 7 hour layover is going by faster than I expected. We are still waiting for Sam to arrive from New York City and catch the plane to Santiago with us. We’ll be flying over night for 9 and a half hours and arrive in Chile tomorrow morning. We’ve been spending time getting to know each other, pressing Dr. del Prado with questions about what everything will be like when we get there, and going over our lesson plans.